Input Your Favorite Low-Cost ICT Device for Education Today! 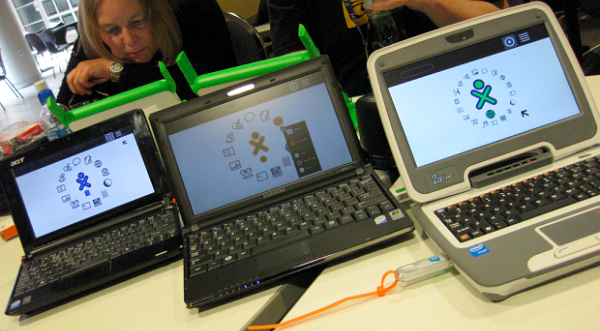 What Low-cost ICT Devices are Available to Educators Today? Back at the turn of the century, education was gripped by the diffusion of amazing hand-held devices for children. These tools, at first considered an expensive and delicate novelty, soon became standard for every child in wealthy education systems and from there defused around the world to nearly every classroom. This is actually a description of slate tablets in the early 1800’s, but it could aptly describe the technological revolution we are seeing in education today with low-cost ICT devices. From single-purpose educational aids like the Teachermate to commercial netbooks that can be re-purposed for the classroom, information and communication technology is dropping in cost while increasing in functionality and robustness. Soon, these ICT devices will be like slates in the 1800’s – ubiquitous. In 2008, infoDev at the World Bank complied a Quick guide to low-cost computing devices and initiatives for the developing world to try and record the most prominent or promising of these devices. The list itself is now available as an editable Google Doc – we invite you to review and contribute to it here: Low-Cost ICT List – Draft Update. Our goal is to have a comprehensive, up-to-date list by the end of June for future publication on the infoDev website. Do note that we do not expect this list to be exhaustive, it’s a Quick Guide after all, and we are purposely leaving off mobile phones, as well as the plethora of devices that could be used in education, for a more targeted list of hardware devices that are used in educational systems of the developing world. « Closing Statements on: Are ICT Investments in Schools Wasted? Written by Wayan Vota on June 2, 2010 in Low-Cost ICT Devices. Audiovisual technologies are a neglected subset of ICT. We already have too many acronyms but (for this post only) let's refer to this subset as AVICT. Well, this is a great idea to consider. A very great idea. The appropriate question might be, What's low cost? And the more important question is: What's high value? "Low cost" is always relative – for this list, we're looking at what might be affordable for a school in the developing world. Yet even that is an odd metric. I can see a school receiving Amazon Kindles (one already has) or Aplle iPads through donor action and then building on that initial donation, while it would only be relatively wealthy private schools or middle-income countries that could purchase technology for school directly. So please use your best judgment – for low-cost and high-value. Another hidden cost is mind space (mastering the operation of the device). Laptops & notebooks require more mind space compared to a video projector. Only the video projector operator has to master the user interface (far easier than a computer). The viewers are not required to engage in any user interface. I’m assuming that LCD projectors are included in AVICT, yes? And as mentioned, I’m assuming that cheap isn’t the sine qua non of this discussion (otherwise radio wins hands down), but it’s the cheapness-to-impact ratio that’s interesting. If we 1) look at effectiveness in relation to improved classroom practices, and; 2) look at adoption rates, barriers to effective teaching and learning, and all the other sh•t that takes place in the classrooms –> IMHO the most cost-effective and high-impact, low-cost ‘rig’ is a netbook-projector-3G mobile-broadband connection package. The teacher should, using this rig (in the context of a coherent national push for electronic support for education) be able to access small-footprint digital “content” — maps, photos, diagrams, tables, charts, drawings, texts, bitty audio clips I suppose, all the stuff that classrooms in poor countries don’t have. And, as is commonly shown in edu research, learning resources basically contour what happens in the classroom: If I’ve got a resource that connects even loosely to my lesson on, say, electromagnetism or (harder) electrostatics, well, I’ll use that resource rather than try to find or make something else. SO: The 3G connection (US $10 for 24 hrs online time in Indonesia), which is slow and widespread brings “reach” beyond the school, the LCD projector (RETAIL US $172 http://www.picoprojector-info.com/) gives the teacher an ICT “analog” for the chalkboard and makes the resource accessible to kids, and the single netbook (US $112 http://www.china-wholesale-supplier.com/Wholesale…) basically is used as an interfacing tool between the input (online content) and the classroom output. Of course, behind all of that there needs to be an easily searched language-of-instruction repository of digital stuff that maps directly to the curriculum. But while the design of the repository and the stuff is ttricky all the way through, the cost isn’t much (US $500,000 – $1 million, which translates to $100 per school if you have 10,000 schools). * That’s my, um, US $0.02. *As a point of reference in relation to scale, I believe that Syria has about 10,000 senior secondary schools. The effectiveness of integrating ICT in education does not necessarily depend on access to latest technological devices such as computer lab, laptops, interactive whiteboards and internet connectivity. Increased penetration of these technologies into classrooms in the developing world does not equate to increased learning return in such societies. Despite their potential, these “new” technologies do not diminish the utility and applicability of “old” technologies such as radio and television in student-focused education. The potential of these technologies in education remain largely untapped. Given all the supporting factors for effective integration of technology in education, low-cost ICT devices are more effective in educational development in the developing countries. Among such supporting factors are the design of the learning space/infrastructure, cost effectiveness, ability to repair and maintenance technological devices and the level of technological skills among teachers. While these factors are already in place in advanced countries, they are lacking in the developing countries. as this mail about low cost technology comes in …. You are a strong debater, I noticed in the Delhi debate. Now we have devoted a entire blog to the issues involved – but especially to put the spotlight on low cost technical appliences and use in developing economies. Maybe you would like to recommend this blog to all those following this debate. at low budget with a tested technology and ready-to-use transparencies. in middle and low income countries. Only electricity is needed. You might like to share this information with colleagues just by forwarding the URL. Feel free to use the information and images found here. This, notwithstanding, recent efforts in ICT in education in many developing countries has continued to be focused on computers and allied technologies. The question is not whether low-cost devices are effective in education development. Rather, the concern should be how developing countries can most effectively explore the potential of these devices within their local contexts to increase access to quality educational contents. Please keep adding to the low-cost ICT devices list. While I think its comprehensive so far, with general commercial devices that could be used for education, to those devices specifically designed for educators, I'd love your regarded opinion on our options. Better yet, do you have innovative ideas on how to use these devices in education? I’ve been into blogging for quite some time and this is definitely a effective and well written post. You should definitely check my personal list of wholesalers and suppliers exclusive to eBay and Amazon that I have collected over the years I’ve worked on eBay. I am not very superb with English but I come up this real easygoing to read . Really informative and fantastic body structure of articles , now that’s user friendly (:.